Since 2009 the Lib Dems have been encouraging apprenticeships – first in Milton Keynes, and then after 2010, across the country. Modern apprenticeships provide flexible training while you earn, giving students between one and seven years of high quality training backed up by practical experience. Now one of our local companies has contacted us asking for help publicising vacancies in Kingston. Please contact them if you are interested. Remit Training is offering two lucky young people in Milton Keynes an amazing opportunity to get into the automotive sector. Remit is working alongside Sytner Mercedes Benz, based on Grey Friars Court in Kingston, to offer two young people the chance to be Sales Apprentices with the biggest retailer of prestige cars in the UK. The roles offer the candidates a chance to gain nationally recognised qualifications and be fully-employed from day one, as well as a chance to get valuable work experience. But this is no ordinary apprenticeship. Sytner is offering the young people who take up the opportunity the chance to earn £12,000 per year with a further earning potential of up to £3,000 bonus paid on achievement of the qualification after two years. This is one of the highest-paid available apprenticeships in the country, and the high quality training delivered by Remit Training, Sytner, and Mercedes-Benz, will provide any young person with a CV to be proud of. Steve Barker, Sales and Marketing Director for Remit, said: “An apprenticeship is always a fantastic route into work, not only providing you with employment, but the opportunity to build your skills, knowledge and experience, while achieving nationally recognised qualifications. This is one of the more elite apprenticeships available. Those applying for the Milton Keynes positions must have a valid UK driving licence and grades A-C in GCSE Maths and English and be educated to A Level standard which may include an NVQ, BTEC National or Diploma level qualification. Remit works with more than 4,000 apprentices across the country, the majority in the automotive industry. It also works with young people in the IT, hospitality, health and social care, customer service and business administration sectors. To apply, please contact Remit on 0845 8399 200 or visit the website: http://www.remit.co.uk/vacancies/. Will you help us protect the 3 million British jobs that depend on Europe? UKIP want to put those jobs at risk by pulling us out of Europe. Only the Liberal Democrats are standing up for those British workers whose jobs depend on us being in Europe. This is a really major issue in Milton Keynes. We have lots of firms owned by european companies, who rely on easy traffic and transport of goods between their base here and Europe. We have other firms whose main market is in Europe, and who don’t have to worry about import restrictions and trade agreements as a result. And we have still more firms that depend on european trade agreements to import their goods from countries world-wide. If we leave the EU, all that has to be renegotiated – and it can take years! 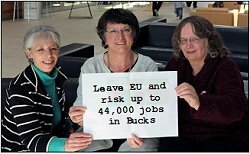 LibDem MEP Catherine Bearder visited Milton Keynes recently and discussed the benefits of being in the EU. The EU has helped fund 44,000 jobs in Bucks and Milton Keynes since 2010, and many MK companies do most of their business with the EU. Many people are still finding it hard to find get jobs locally – but the Tories have made it worse by removing MK Council’s recession-buster’s web pages that helped point people to key advice! Cllr Jenni Ferrans says “Things are actually looking up in our area – Waitrose at Oakgrove, more shops and the library at Kingston and A G Barr at Magna Park will all offer jobs – but we need to help local people get the jobs!